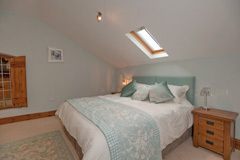 Book a luxurious Somerset B&B near the A303 in Podimore. 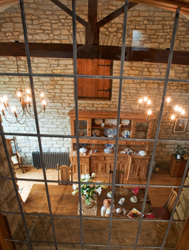 Church Farm Barn is a beautiful barn conversion overlooking the village church of St Peter which dates from the early 14th century. 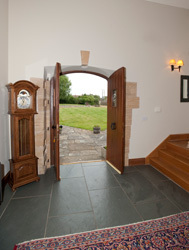 The beauty of Church Farm Barn lies in its many original features along with modern facilities. The Board family have lived on this 240 acre dairy farm since 1985. The farm is home to the Podimore Milton Pedigree Holstein Friesian herd. Church Farm Barn lies only one mile from the A303 and A37, and is ideally situated for visiting our many local attractions including the Fleet Air Arm Museum at Yeovilton, the Haynes Motor Museum and the Bath and West Showground. 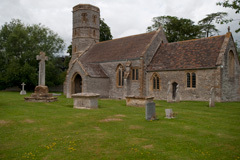 There are several National Trust houses in the area, including Tintinhull, Montacute, Lytes Cary and Barrington Court. 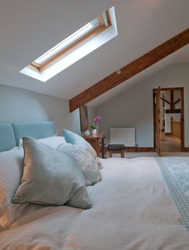 We are approximately ten minutes from the ancient town of Somerton, Sherborne with its abbey and only twenty minutes from Castle Cary and Street with its famous Clarks Village. Glastonbury, famous for its Tor and Festival, is barely twenty minutes drive. 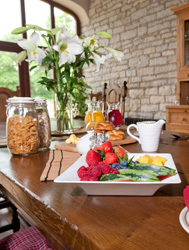 Our bed and breakfast is also a wonderful stopover for parents visiting nearby schools including Millfield, Sherborne and Kings Bruton. For business guests, we are ideally situated one mile from the Podimore roundabout and can offer a relaxing break away from it all at the end of a stressful day. We have ample off–road parking and gardens to enjoy. 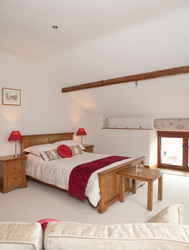 For the comfort of all our guests, Church Farm Barn has a non–smoking policy.